Current estimates place salt chlorination in over 75% of all pools in Australia and New Zealand. BioGuard has therefore developed the following range of salt pool products to enhance the operation of salt pools. BioGuard Salt Pool Stabiliser is a granular cyanuric acid for use in salt chlorinated systems that prevents chlorine loss due to sunlight and prolongs salt cell life. 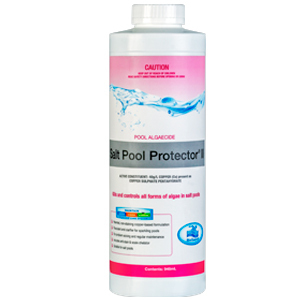 BioGuard Salt Pool Protector is a highly effective algae inhibitor that works extremely well with salt chlorinators to prevent and kill a broad variety of algae. 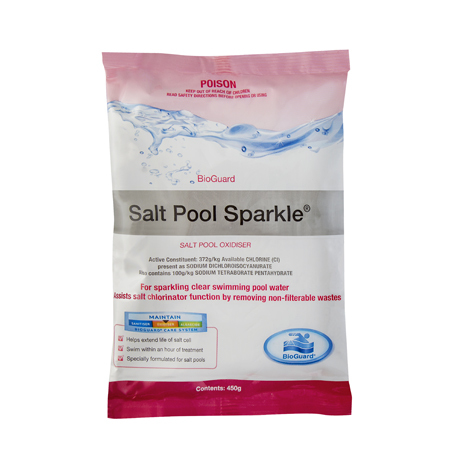 BioGuard Salt Pool Sparkle is a maintenance oxidiser for salt chlorinated pools with a unique blend of oxidising and clarifying agents. 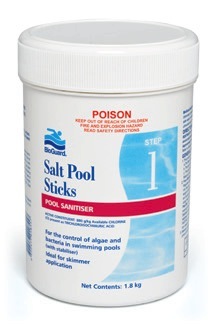 BioGuard Salt Pool Sticks are 225g sticks that dissolve much slower than regular trichlor sticks or tablets when the pump is off and can last up to twice as long. BioGuard Salt Cell Cleaner is designed to effectively clean chlorinator cells of scale deposits and other material without damaging the cell. BioGuard Salt Pool Stain & Scale Control is a liquid sequestering agent that prevents the formation of scale in salt chlorinated pools.